Photos and design ©1998 -2019 PST Co. Ltd. All rights reserved. from low-budget systems built on basis of Woodward EasYgen-1000 series controls, up to complex control systems allow personnel-free operation for generators sharing common load, equipped with comprehensive controls Woodward EGCP and EasYgen-3000 series under Register of Shipping rules. 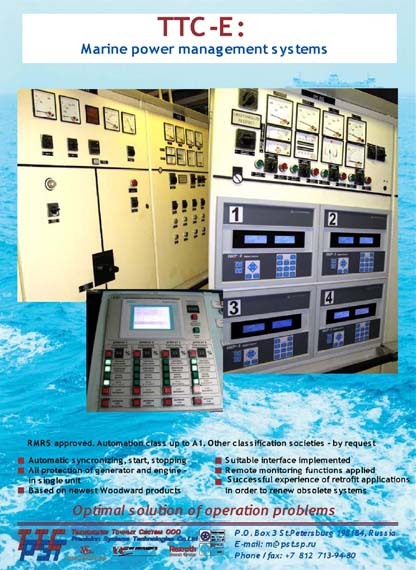 The TTC-E solution fits well not only new built PowerStation for vessel and shore application, but also obsolete systems, to retrofit ASA, AGS, Stromberg, KZG, DAU SDGT, ROSA, etc.